Fun Measuring Math Activity for Elementary Students: Take Your Feet Off the Table! Make elementary math manipulatives to use all year any time your students need to measure something. Enhance math activities for elementary students with "personal" feet when learning about linear feet and measuring in math! Turn the tagboard so that the 12" side is on the bottom. This is the bottom of the shoe. Instruct the students to draw a profile/side view of a shoe. The important thing is that the bottom of the shoe takes up the whole 12" of the tagboard. Any style of shoe is fine as long as the bottom of the shoe measures 12". 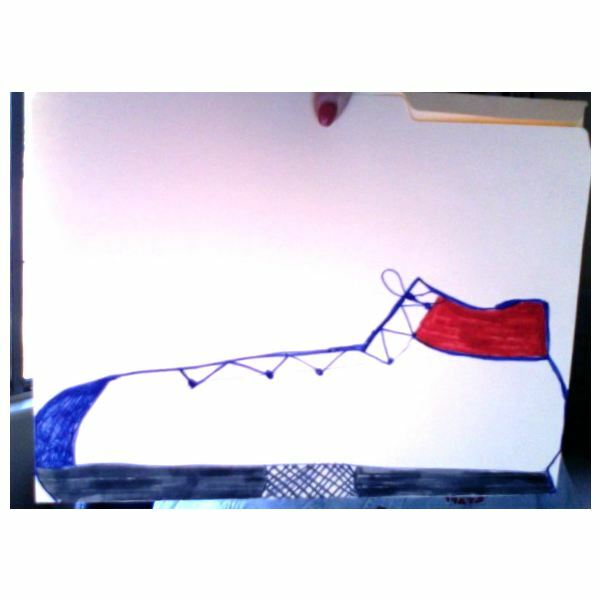 The students should not cut out or color the shoe until the teacher has looked at their sketch of it. When the students cut out the shoe, remind them not to alter the bottom. Both sides can be colored/decorated. Encourage bright colors and uniqueness! These will be used all year. Allow students some time to explore the room measuring things so that they get a sense of how much a foot is. Suggest that they can partner with a classmate/classmates to measure larger things. Next gather the class together to discuss the dimensions of the room. Write some predictions on the board and have students vote for the prediction that they think is the closest. Now it is time to measure by lining the "feet' in a straight line stretching from one end of the room to the opposite end. The feet should touch but not overlap. Were any of the predictions close to the actual length and width of the room? The same procedure can be used to measure the hallway, gym, cafeteria, etc. But don't stop there! Keep the "feet" handy for any occasion where a measurement can enhance learning. Are you studying animals? Get a better perspective of what a thirteen foot alligator looks like by lining up 13 "feet" on the floor. Reading a biography of Shaquille O'Neal? He is 7'1" tall. Some early settlers moved their family and possessions in a conestoga wagon which was 24' x4'. How do you keep overzealous students from pushing each other when they lay “feet” down to measure something? I have a simple solution which works for most classroom management situations and especially when using these elementary math manipulatives. The first day of school the students line themselves up in alphabetical order. Each student is assigned a number based on their position in line. (Adam Andrews may be #1 and Zoe Zucher may be #28). This number is theirs for the year. When measuring with the “feet”, have students line their ‘feet’ up in number order. It avoids problems and is done quickly and efficiently so that the lesson is not interrupted! Elementary students will love using their newly acquired “feet” to discover the true size of familiar objects. The great part, is that they can be used in any lesson! Have fun! Ideas and activities come from the author’s twenty-five years of teaching experience.